In a dimly-lit studio, artist Juan Travieso is sharing a selection of his works, illuminated by the glow of a PowerPoint presentation. He explains the meaning behind each painting: a desire to depict nature being overrun by man for one, an homage to an endangered bird species in another. The scene has all the makings of an elite event, including an intimate setting, a prominent artist, and an audience eager to learn. This special presentation is the latest offering of the Art By Coalition Children (ABCs) Program. The interactive session, held in the art room of the Women’s Residential and Counseling Center (WRCC), gives Coalition kids an incredible opportunity to interact with a professional artist. Embedded in Juan’s presentation, although you wouldn’t know it based on the fun the kids are having, is a lesson on endangered species, their habitats, and the causes for their near-extinction. With each slide comes a different work, and with it an audible appreciation from the audience. 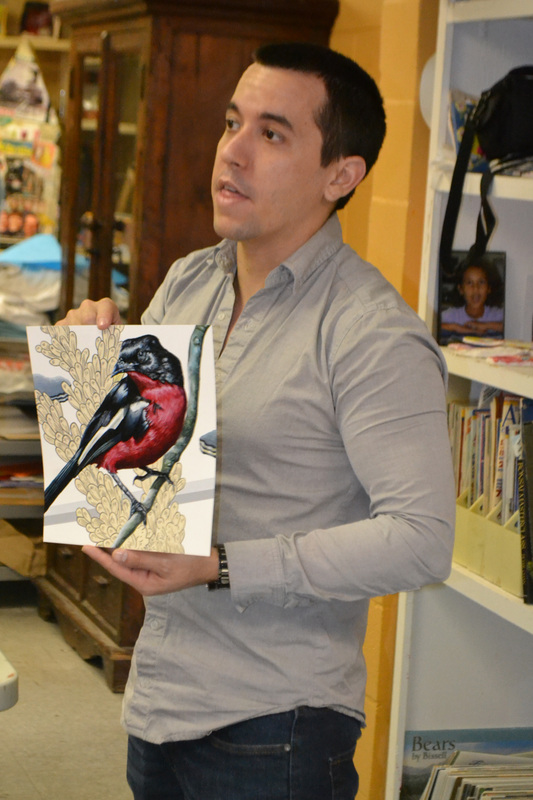 “That looks straight up real,” comments one student, in awe of a detailed painting of a bird. Taken aback for a moment, Juan responds with a humble thank you. Following the presentation, the class surrounds Juan as he explains his method behind creating a sketch before applying paint to his work. Sketch lightly so that it’s easier to erase, he suggests, as the outline of a bird comes to life on a canvas. He reminds the class to keep in mind the elements of art, such as line, shape and value, before they return to their seats to work on their own paintings. Now in its 12th year, the ABCs Program has paired students with more than 40 artists representing a variety of mediums, including filmmaking, digital photography, pottery, sculpture, and theatre. Bonnie Newman, the program’s volunteer coordinator, has overseen ABCs since its inception. “It’s an opportunity to see homelessness in a different light,” she said of the program. 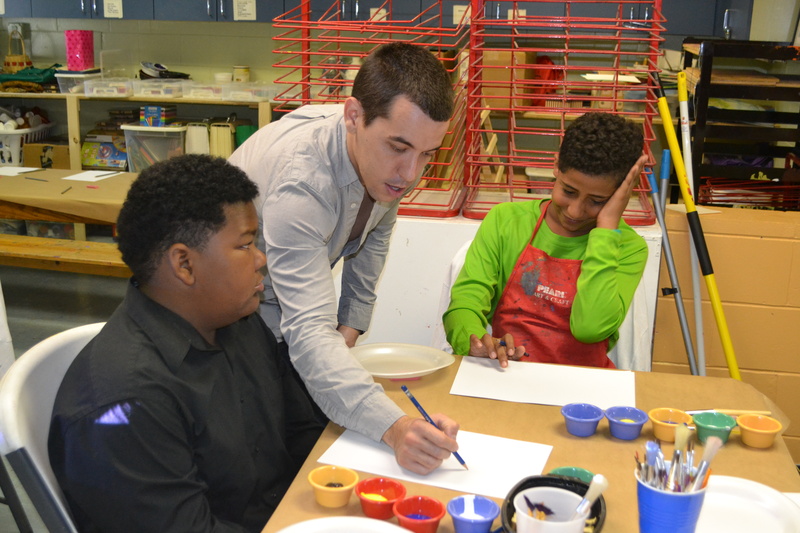 A grant obtained by ABCs partner, the Orlando Museum of Art (OMA), helps fund projects for the program. At the session, volunteers from the museum, as well as OMA instructor Catherine Cross, associate curator of education and outreach Ross Quesnell, and curator of education Jane Ferry are on hand to keep brushes clean and water fresh for the young artists. Thanks to community support, Coalition children have the creative freedom to express themselves in a supportive environment through ABCs. Nuturing creative talents goes a long way toward combating the low self-esteem that children in a shelter sometimes experience. Ultimately, the goal of the ABCs program is to encourage and inspire. It’s a goal that is shared by all ABCs artists, including Travieso, who said his own inspiration came from a quintessential kid pastime: cartoons. Born in Cuba, Travieso said he first started drawing as a child because he loved watching cartoons, often sketching as he watched a 30-minute show. 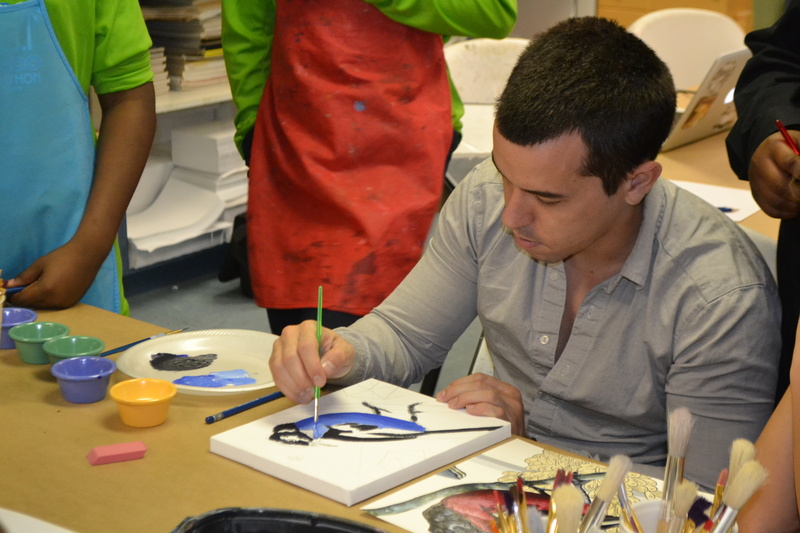 He adds that he hopes the up-and-coming artists of the ABCs Program continue to pursue their passions as they grow older.